Take all 409 yds for $65! 100% Falkland wool, hand spun 2 ply. 12 wpi sport/worsted weight. Next to skin soft. These two skeins are fromthe same braid of top, but one skein definately has more blu in it. The skeins can be purchased separately or together. Two hand spun skeins available. 100% Corriedale, 2 ply, 9 wpi, bulky weight yarn. Next to skin soft. 100% Corriedale Sheep Wool hand-dyed then hand-spun. A fresh, minty blue. Two ply, worsted weight. Only these two skeins available. 100% Falkland Sheep Wool. A fun blend of turquoise and beige, just like the beach! Two ply, hand-dyed, hand-spun, worsted weight. Only two available. 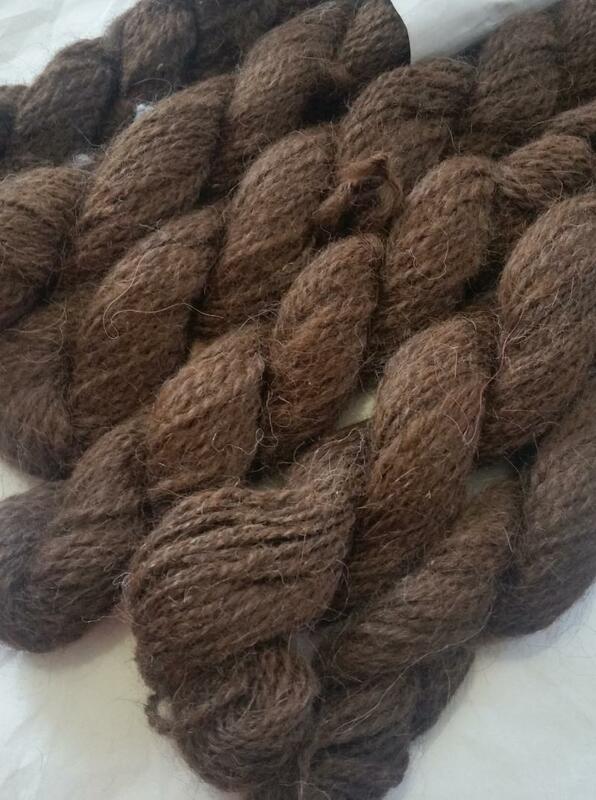 100% llama, hand -spun, natural color, two ply. 100% Suri Llama, solar dyed, hand-spun, two ply. Bright salmon color. These are the only three available. Color will not be able to be reconstructed. 100% Silky Llama. One of the softest fleeces I have ever felt. Reserve Champion Fleece at the 2008 Lamafest Show. Hand-spun, two ply. WOW! A one of a kind skein of yarn. A blend of 50% Corriedale Sheep Wool and 50% Tussah Silk. Nice and soft, 3 ply, hand-spun. 1.1 oz 64 yds of hand spun Australian wool. Two skeins available of Cotswold, Border Leicester﻿, and Angelina; a coarser fiber, great for outerwear.Sport weight, double ply. 1.9 oz. 132 yds. $21.75. Two skeins available of this hand spun goodness! A merino blend, ever so soft! You can see the different metallics in this yarn. I see silver, copper, and gold! worsted weight. 2 ply. Did I mention soft!!! Amazing! ﻿Straight from the herd! Triple ply, hand spun inits natural color. 253 yds hand spun Two ply, 9 wpi, Lots of colors! blue, red, green, orange, yellow.﻿﻿100% CVM Sheep Wool with just a splash of color. How fun! Only two available. Passion is a beautiful lavender that is nicely put together. A blend of Sheep Wool, Mohair, and a touch of Angora. 100% Suri Llama yarn. Natural color, hand-spun, two ply, worsted weight. 100% natural llama. Riyal is one of the fuzziest llamas I've ever seen! Hand-spun, two ply, worsted weight. This is a one of a kind skein! 50% Tussah Silk, 50% Merino Sheep Wool. A blend of light greens, very soft in both touch and color. Navajo Triple Ply, worsted weight. One of my personal favorites! 100% super soft Merino. Hand-dyed, hand spun, two ply, 9 wpi worsted weight. Clearance $40.00 for the three! 100% Silky llama. Very soft! Raised in Northern Michigan. Hand-spun, double plyed. Another art batt creation! Boromir is made of beautiful shades of grays and blues. It is made of Alpaca, silk, BFL, merino, and Angelina. This is a one-of-a-kind skein. sport weight, double plyed.